Autism in Paradise: The "Hurt Program"
One of the (many) things I hate about autism is Ryan’s severely diminished ability to communicate his wants and needs to us. What is particularly terrifying at times is his inability to tell us when he is sick or hurt. Add to this the fact that Ryan appears to experience pain in a somewhat different way. I’m guessing here, because he can’t tell me, but Ryan has shown up with bruises and scrapes I don’t always know how to account for and this leaves me feeling guilty and sometimes like an all-around bad mom. Other times, I just don’t know he’s even hurt himself. For example, back in November Ryan was playing in our back yard—on the play set, trampoline and walking around the pool area. I was watching him as he did this. As he was about to walk in the door to the house, a shady area, he suddenly stiffened and began screaming. I had no idea what was going on. He doesn’t usually cry like this when frustrated or overstimulated, but I hadn’t seen anything happen to him. I picked him up and calmed him down and he went about his business. Later that day, I picked him up to wipe his feet and saw the soles were covered with angry-looking blisters. Apparently, he had burned his feet on the decking around our pool (it is hot in Hawaii in November). He didn’t react while standing there, so I didn’t realize his feet were being burned. It was only when he started to come in the house that the pain hit him—again, I’m guessing. This is one of the challenges of autism. Because he doesn’t experience pain in the same way an NT person does, sometimes I don’t realize he’s hurt. I know when a surface is too hot for my feet because I feel it immediately; Ryan does not. There are other aspects to his inability to communicate pain, injury or discomfort. Recently I had to take Ryan to the doctor for an odd bump in his head that had been there for weeks. The nurse asked me all sorts of questions—when it happened, how it happened…questions I couldn’t answer. “So you are telling me Ryan was injured while unattended?” she asked, her voice rising with what seemed like an accusatory tone. “So you’re alleging abuse then?” was her next comment. Whoa—what a leap and although perhaps she was doing her job, this nurse had made me very uncomfortable by this point…either I was a neglectful mother for not knowing why my son had a lump in his head or his teachers and aides or au pair might be abusing him. 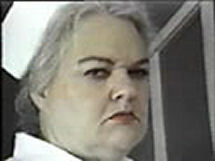 Either way, I was concerned she would recommend a visit from child protective services. Fortunately, the doctor came in right about then and quickly diagnosed his bump as seborrhea, possibly caused by a fungal infection—child abuse or neglect implications eradicated. 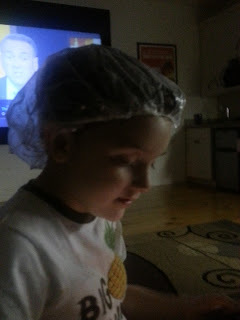 Prescribed a topical medication that required Ryan to sleep in a shower cap, but by day 3 it was gone. Ryan in his shower cap...he handled it better than I would have! I told Ryan’s IEP team at school we have got to teach him to tell us when he’s sick or hurt. The incident with his feet and the mystery bump served as motivating reinforcers for me—if you’ll pardon the ABA-speak--that this should be an immediate priority. His autism teacher came up with the “Hurt Program” in response. His team, us included, are working on teaching Ryan about being hurt, telling us he’s hurt, and pointing where—all of which is totally natural to an NT person, but not for Ryan. Last week we took turns smearing ketchup on ourselves, pretending to cry and teaching Ryan to ask, “What’s wrong?”, to which the “injured party” would then simultaneously sign and say, “hurt”. We then worked on teaching Ryan to ask, “Where?” and taught him to point to the area. 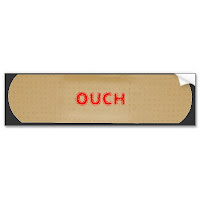 We then put band-aids on our “wounds”. I think it is starting to sink in for Ryan, at least I hope so. We had some laughs while enacting the Hurt Program, but it really is serious business. Ryan has got to learn to communicate when he’s sick or hurt, or perhaps even more important, when someone has hurt him—an autism parent’s worst nightmare. Because these kids often can’t communicate, certainly there needs to be vigilance in looking for signs of abuse, and I’ve written about horror stories of abuse of autistic children, often at the hands of caregivers. That said, physicians and their staffs need to learn about autism, and realize these kids experience pain differently, and because of disregulation of their vestibular sense (balance and equilibrium), often seek to engage in dangerous climbing and jumping behaviors. Abuse or neglect should not be the first conclusion drawn. There are cases of doctors and social workers mistaking symptoms of autism as signs of parental abuse. More on that issue at a later time.